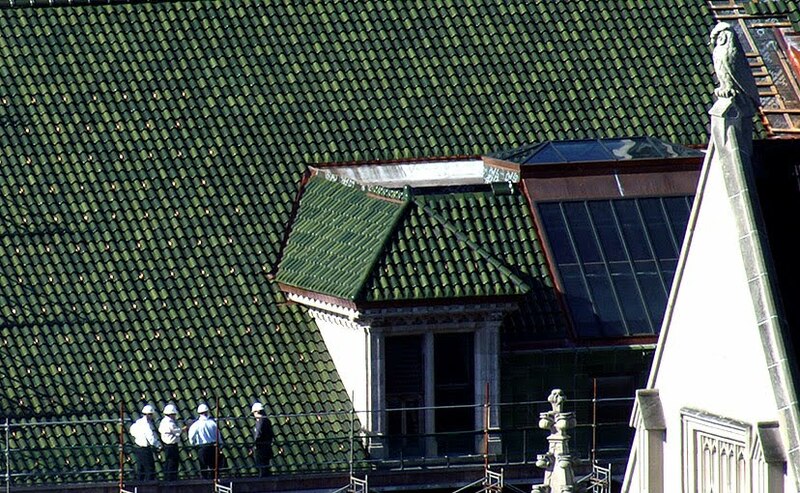 Via our indefatigable correspondent Bob Johnson, we bring you these photographs of the ongoing repair of the gabled clay tile roof of the 1912 Monroe Building, by Holabird and Roche, with the current work being done by their successor firm Holabird & Root. 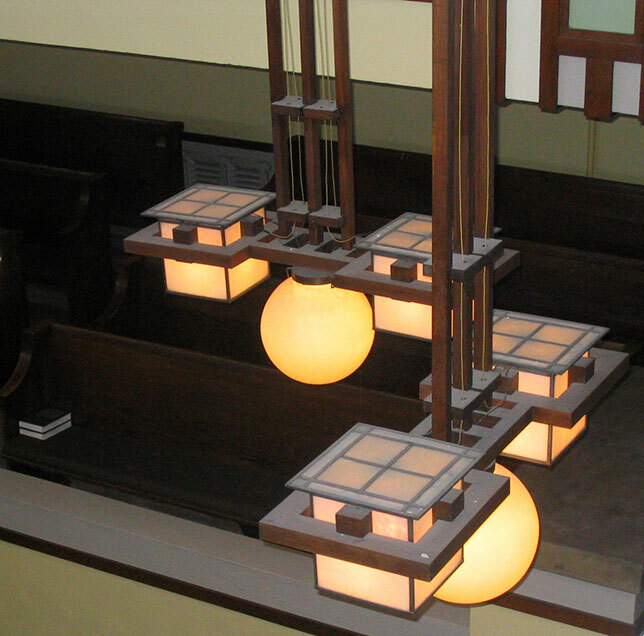 Also being restored are the skylights of the studios that have been home, at various times, to Walter Burley Griffin and Marion Mahony, Barry Byrne, and Alfonso and Margaret Iannelli. 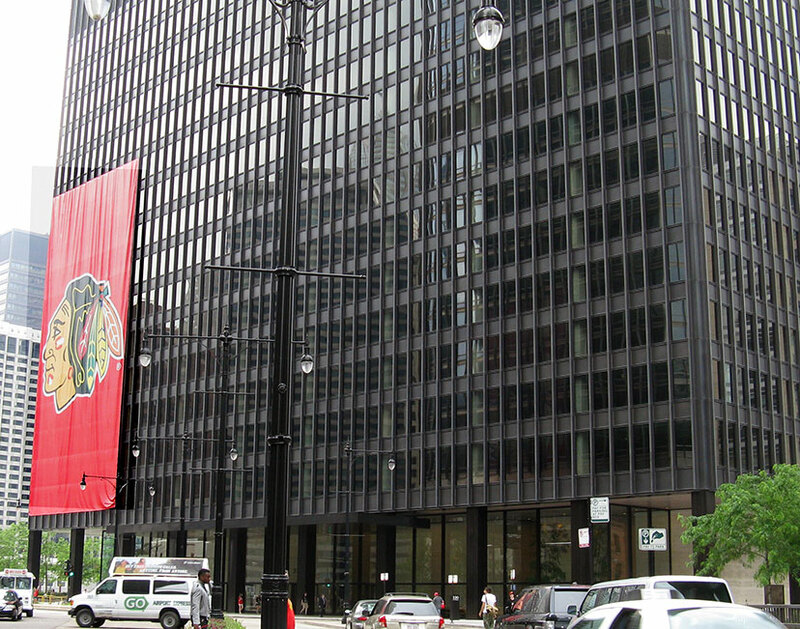 Mies was approached about the commission for the IBM Building in 1966, the year of this 80th birthday. According to an article in the July 1972 edition of Inland Architect, Mies arrived to inspect the site in a wheelchair, impaired by the arthritis that had plagued him for nearly a decade. 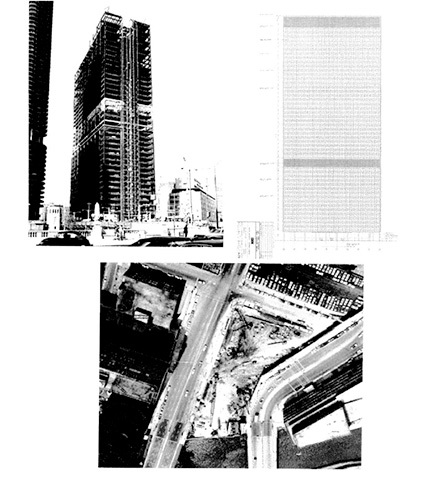 Looking at the irregular 1.6-acre plot hugging the north side of the Chicago River between Wabash and State streets, Mies asked, somewhat perplexed, "Where's the site?" 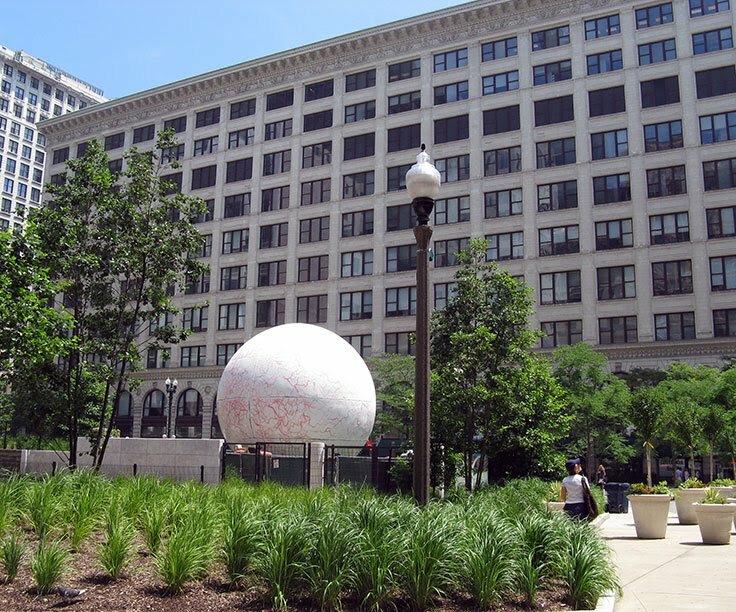 As I wrote in The Reader a while back, the dirty little secret is that a primary purpose of the the Commission on Chicago Landmarks - kept squarely under the thumb the Department of Planning, now Zoning and Land Use Planning - is to make sure preservation never inconveniences clout-heavy developers. Stating this rather obvious fact provoked the expected outraged letter to the editor from the bureaucrat-of-the moment heading up Planning, attacking me for slighting the hard-working staff of the Commission. This, of course, was the usual smokescreen non-response to the real issues I raised. The dedicated staff of the Commission on Chicago Landmarks do remarkable work, and now some of best of it can be downloaded from the city's website. 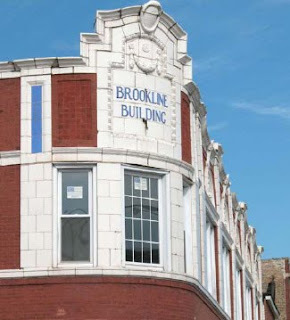 Every time a building or district is proposed to be made a landmark, the staff creates a report documenting how the nominee meets the landmark ordinance's criteria for designation as an official Chicago landmark. This analysis actually usually only takes up the last few pages of each report, and while those few pages are what gets a building on the roster, it's the balance of the report that's enduringly valuable, where commission's staff creates an incredible work of scholarship, generously illustrated, of the building and its place in the history and architecture of Chicago. 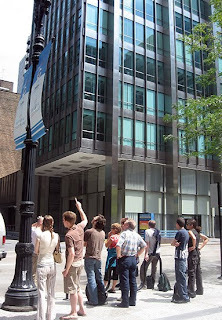 The report for the IBM Building, for example, quoted above, includes not only a detailed section on the building's architecture, but also a history of the IBM Corporation, an account of The Evolution of the "Miesian" Skyscraper", a biography of Mies, and an extended bibliography. 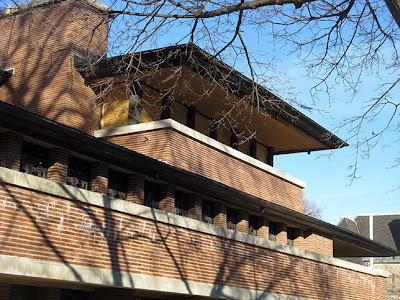 Even more fascinating are the reports on less famous, but also important buildings. 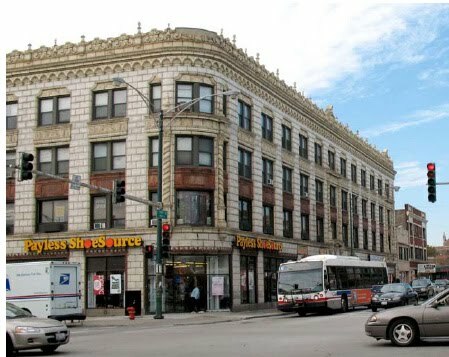 You may well know, for example, the building at 2545 West Diversey that now houses the Green Exchange, created to house hundreds of eco-friendly businesses. 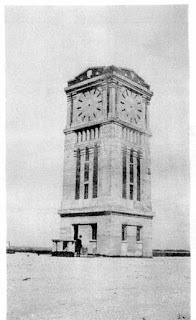 You may also remember its four story tower from when it bore the the name of Cooper Lamp. 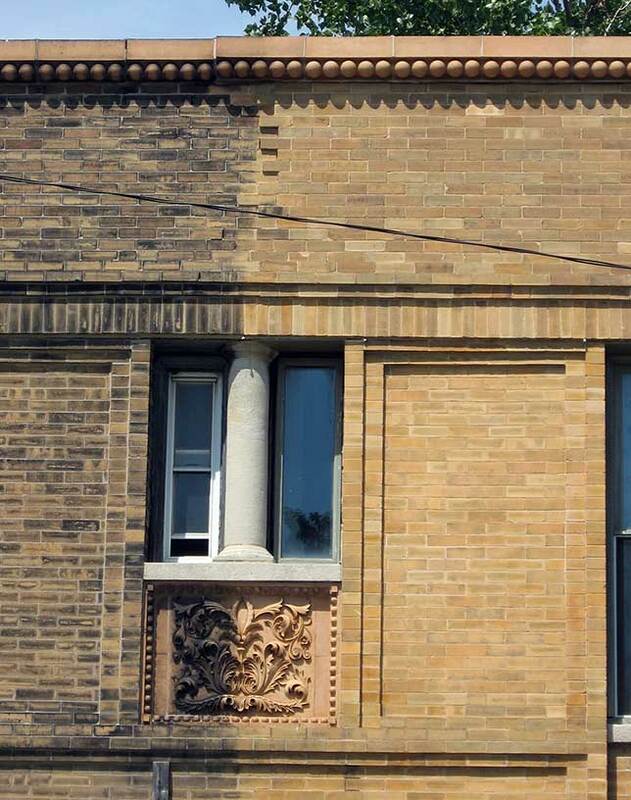 But did you know the 1914 building began as the Vassar Swiss Underwear Company, offering Ribbed Union Suits for Gentlemen? 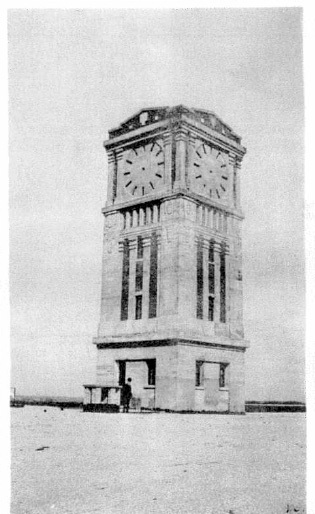 Or that the tower was built to house a gravity water tank? 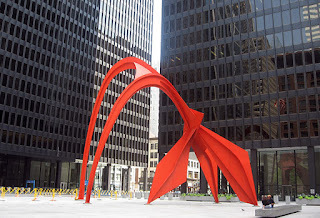 Or that its architect, Lawrence Gustave Hallberg, also designed the structure at Ontario and LaSalle that's now the anchor store for The Sports Authority? Or consider an entire district like Chatham-Greater Grand Crossing If you live there, you know it's full of buildings that give the neighborhood its distinctive character, buildings you may have grown so used to, you've almost stopped seeing them, or appreciating their contribution to the fabric of the city. 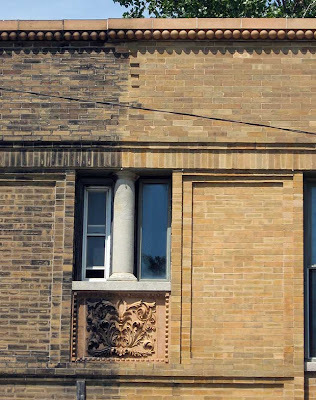 The commission report brings each building alive, giving you the backstory, the architects, the history. 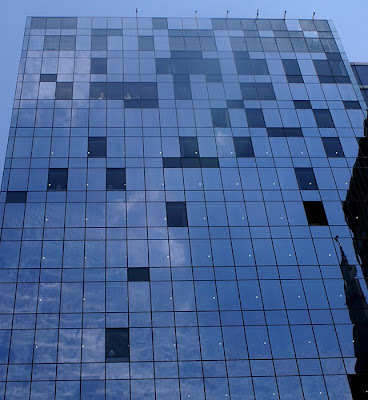 Photographs, both contemporary and historic, give you a feel for the qualities of each structure. 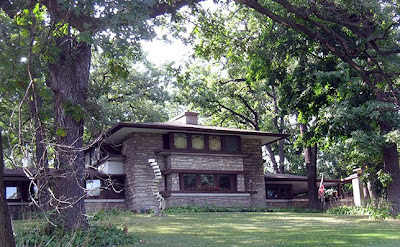 structures currently under consideration. The subjects range from Wrigley Field to the Lorraine Hansberry House, the Germania Club to Roberts Temple Church of God in Christ, which includes a superb history of Emmit Till, whose 1955 open casket funeral at the Church was one of the major turning points in the battle for civil rights. Let's hope they can get start getting the older reports online, as well. (If I can be of any use, I'm volunteering to help.) 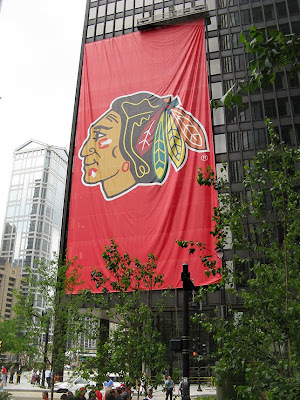 But even now, some of the best Chicago history can be found on this page. Even on a Saturday morning, workmen in Pritzker Park were busy getting Tony Tasset's Eye ready for its scheduled July 7th debut. Judging by the dense web of red capillaries, looking a bit like a map of the Alps, playing across its surface, Eye has been spending its nights on Division Street. 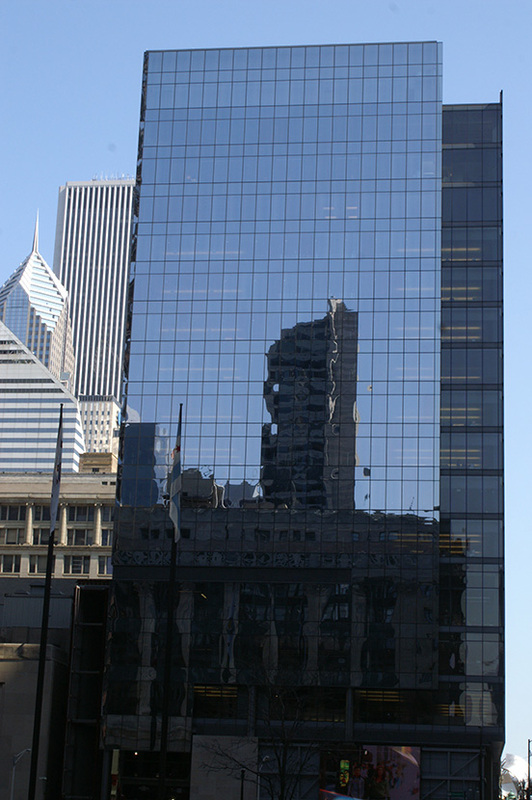 Crain's Chicago Business and The Chicago Reader's Mike Miner reports that Alison True, The Reader's long-time editor who had been with the paper since 1984, was summarily dismissed Friday morning by the latest revolving-door full of executives put in place by Atalaya Capital Management, the current owners trying to salvage some of the $30 million it loaned Creative Loafing, the parent company that bought The Reader in 2007 and spun it into bankruptcy less than two years later. As I said in a comment I posted on Mike Miner's story, The Reader is now at the mercy of a Florida CEO who did such a good job at her last job they let he go, and an "acting" publisher du jour from Texas whose last great accomplishment was cutting the frequency of the publication she managed from daily to weekly. Without Alison True, I would never have become a writer on architecture, but not even that can tarnish Alison's reputation as an exemplary editor who cared about developing writers and nurturing the kind of offbeat outlooks that made for compelling stories. My own story, I'm sure, was shared by many other aspiring writers. 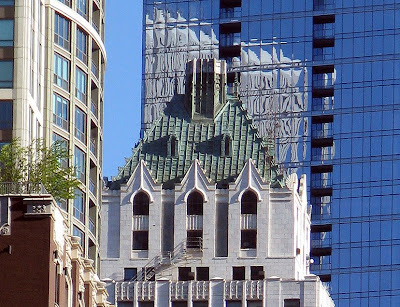 Back in 2002, I was looking out my Marina City window and getting increasingly angry about the often hideous condo towers rising all around me. I put my feelings into an article that my former boss, Wendy Lapidus-Saltz, helped me punch into shape, and I mailed it to The Reader. When I heard nothing after several weeks, I said to myself that it was par for the course for a first effort and I needed to start thinking about what I would do next. Then, I came home to find a message on my answering machine, "This is Kiki Yablon of The Reader. We liked your piece and we're thinking about putting it on the cover." Kiki and Alison gingerly guided their novice contributor through the editing process and the piece, titled, Stop the Blandness! ran on The Reader's front page on January 16, 2003. It was a long piece. 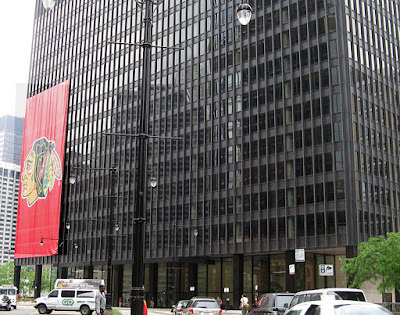 but it got a great response from Chicago's architectural community. And for me, it was an amazing thrill. Dozen's of other articles followed. 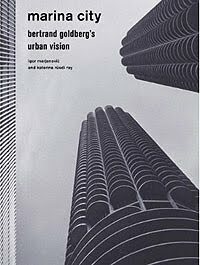 I got to meet and write about Chicago's amazingly talented architects - from Helmut Jahn, to Stanley Tigerman, Ralph Johnson, Carol Ross Barney, Jeanne Gang, John Ronan, and so many more, including a side trip to Seattle for Rem Koolhaas's new public library, and concluding with a different take on Daniel Burnham for the Burnham Plan Centennial last year. It was a great trip. I may have tortured an entire succession of talented Reader editors with my contentious bad humour, but I could still depend on finding a receptive ear in Alison whenever I had an idea for a new piece. And I think I can say, objectively, that a lot of interesting stuff resulted. Week after week, Alison created a product whose quality frequently put Chicago's two dailies to shame. My suspicion is that Alison's unforgivable crime was that her commitment to that quality made her an obstacle to those absentee landlords who seek a cheaper, more blandly marketable, more generically modular Reader whose content can be created largely on autopilot from the home office in Florida. For management to dismiss Alison is a huge misfortune for The Reader and an outrage to its most dedicated readers. 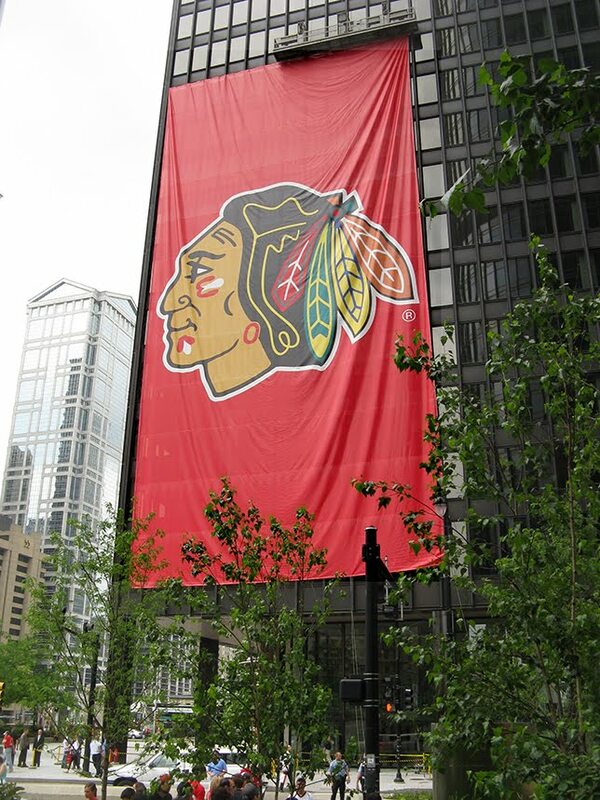 What would be a tragedy, however, would be for Chicago to lose her entirely. We can only hope that a major publication that still retains some capacity for judging talent will snap her up - and quickly. Alison, I would follow you anywhere. You're my hero. Services for musician Aaron Dodd, who died last week, will be held today, Friday, June 25th at 11:00 at Friendly Towers, 920 West Wilson, where he lived from 2007 to 2009. Friends are still soliciting contributions to cover Aaron's funeral expenses, and you can contribute here.
. . . the design commmunity and the general public . . . Nominated projects should have initiated within the last two or three years and have been completed by the time of the nomination (except 25-year category nominations). The deadline for submission is August 28th. Judging by a jury set to include Chicago architect Jackie Koo as well as DE members will take place September 11, with the actual awards given out at a date in October. You can get more info and download the nomination entry form here. It was a dark and stormy late afternoon. Last Friday, 77 mile-per-hour winds and a lot of unnecessary wetness stormed through Chicago's Loop doing rude things. 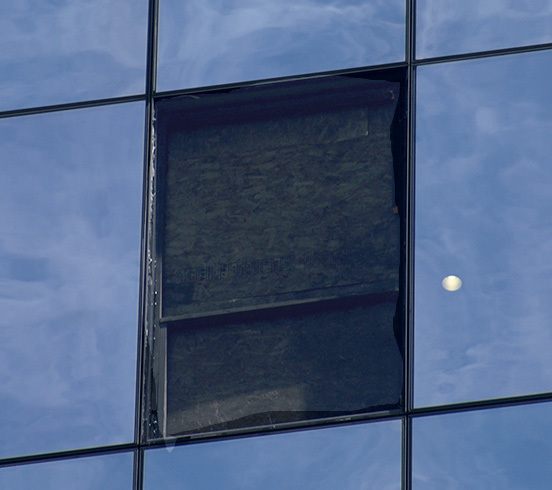 Most of the publicity went to the two windows that popped out of the Tower Formerly Known as Sears. Two more cracked. Big deal. The real action was over at 22 W. Washington, the 17-story Perkins+Will skyscraper anchoring the southwest corner of uncharmed Block 37. No fewer than 35 windows were damaged, shattered, according to news reports, by pebbles carried off the rooftops and hurled by the wind against the glass at a far higher velocity than that commonly required to get someone's attention. When 22 West first opened in 2008, the Trib's Blair Kamin reported that the beleaguered developer used a cheaper quality of glass than that recommended by architect Ralph Johnson, resulting in unwanted distortion in the curtain wall's reflections of the buildings surrounding Daley Plaza. 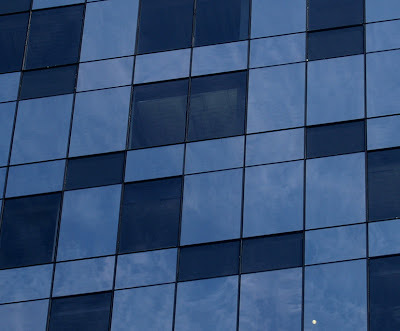 Now, at least for the moment, 22 West's Dearborn facade is a late-Mondrian-like mosaic of dreamy reflectivity and dull, dark voids created where opaque, off-the-shelf replacement panes have been installed. It's like a picture puzzle with a lot of a pieces missing. And for the traditionalists among us, there's even a window boarded up with old-fashioned plywood. 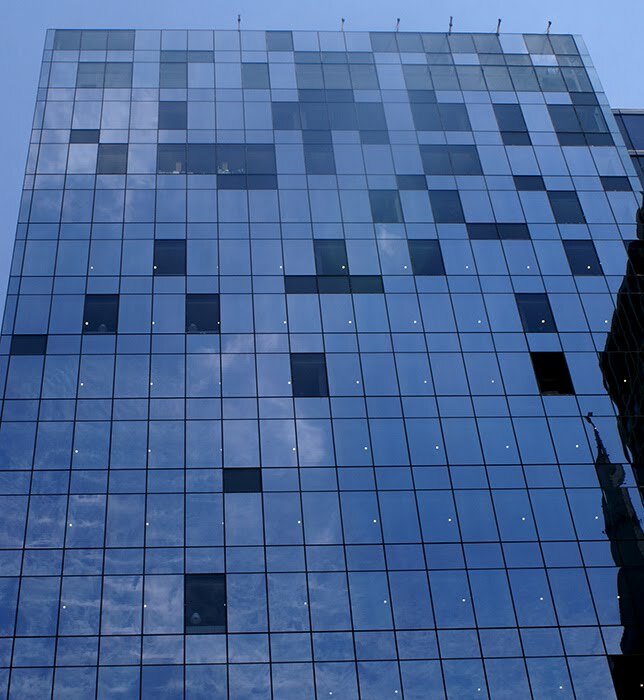 22 West would probably be a more interesting building if, instead of fixing things, they broke a lot more windows, and made the whole thing a more artful counterpoint of reflection and void, contrasting to the uniform mirroring of the structure's other elevations: the almost cliché illusion of structure dissolving into reflections, rudely interrupted by prosaic punctuations of materiality. That's unlikely to happen, however, so enjoy the eccentricity while it lasts. Aaron Dodd from Jim Quattrocki on Vimeo. Fittingly, Windsong is a website dedicated to brass players, including books by the CSO's great tuba player and teacher Arnold Jacobs. A great place for Aaron. Marina City and Motor City: sold out events - with alternatives - plus two great tours, still open. Yeah, I guess I should be getting the updates in a bit sooner. 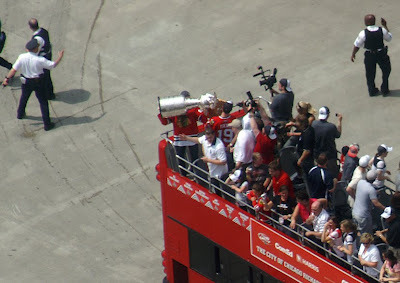 The good news: I've added two great new events to the June calendar. The bad news: they're both sold out (although, since they're free, I should probably just say they're "full up"). However, in both cases, there are alternative ways for you to check our their subjects. Watch the full episode. See more Blueprint America. 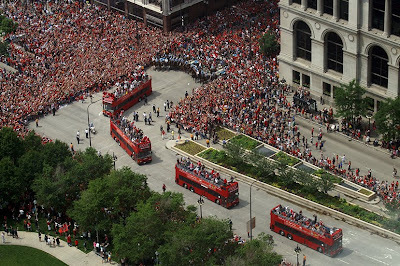 On Wednesday, there's another great event that's you won't be able to see unless you've already made reservations, a showing at the Chicago Architecture Foundation of the video production Beyond the Motor City, which documents Detroit at the crossroads between the auto economy and creating a more sustainable urban center using mass transit. If you can't get into CAF, you can also watch the full documentary, albeit at a substantially smaller screen size, here. 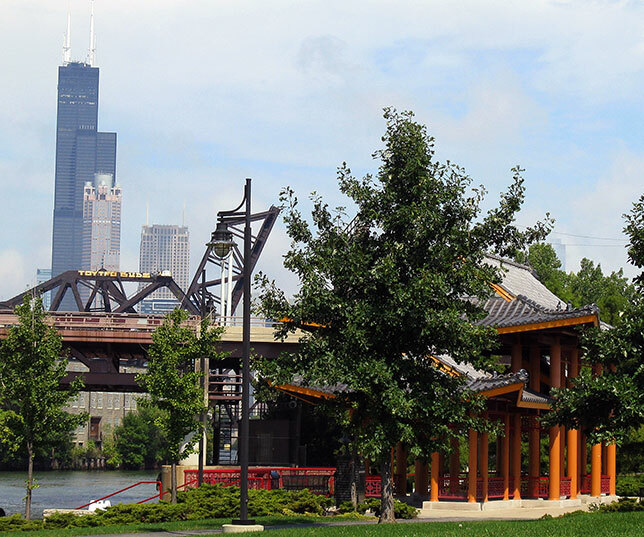 Chicago's Unexpected Urban Oases - On Saturday, June 26th, from 8:30 a.m., to 2:00 p.m., Ernest Wong, Founder and Principal of Site Design Group, will lead a tour of three of the firm’s award-winning urban parks: the Park at Lakeshore East, Stearns Quarry Environmental Park in Bridgeport, transformed from an old stone quarry into a sustainable park with wetland terraces, native plants, and a fishing pond, and finally Ping Tom Memorial Park, along the south branch of the Chicago River. The tour, $40.00 for CAF members, $50.00 for non-members, includes a Chinese buffet lunch under the pagoda, and you can register for it here. 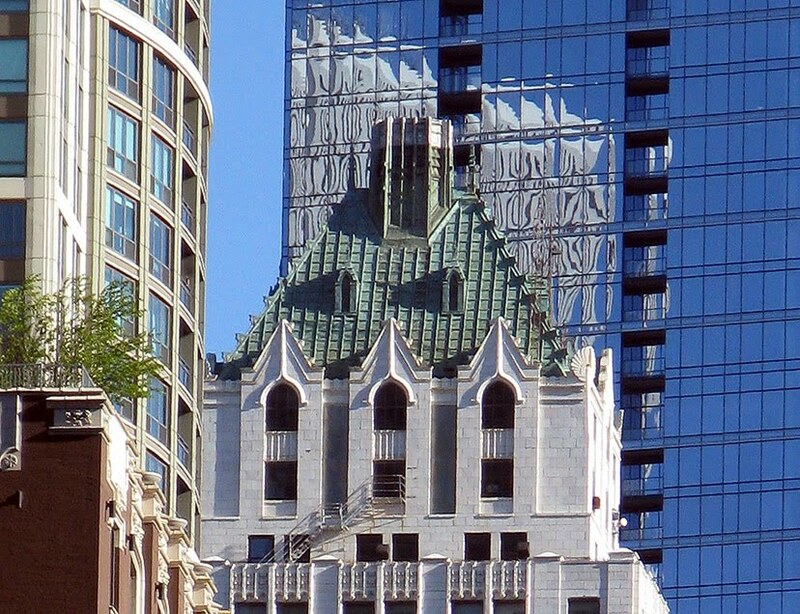 Gold Coast Architectural Dig - on June 30, from 10 a.m., to noon, $28.00 per person, the U of C's Rebecca Graff will be offering up "a walking tour of unusual Gold Coast sites (and the old City Cemetery). Visit the excavation of the Potter Palmer Castle's disposal site." Who knows? Maybe you'll come across that diamond that slipped Mrs. Palmer's finger and rolled behind the wainscoting. Information on-line. 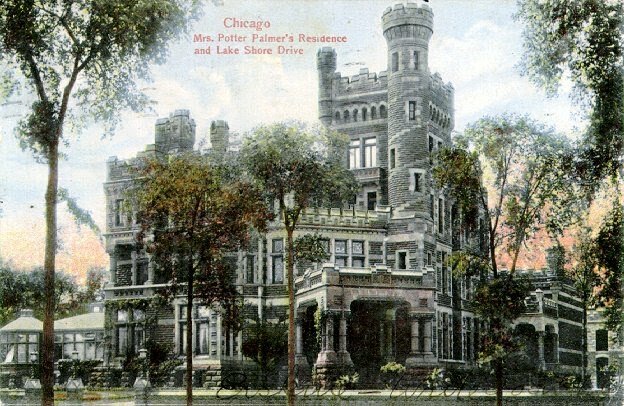 For reservations, contact historian Sally Kalmbach, author of another excellent book that I'll get around to writing about sooner or later - The Jewel of the Gold Coast: Mrs. Potter Palmer's Chicago - at 773/868.9096 or via email. 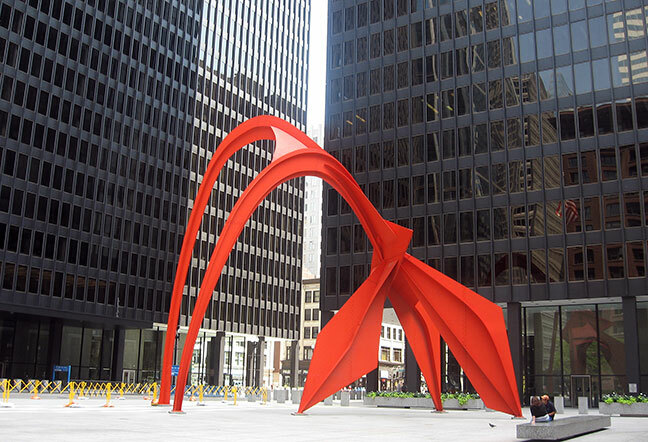 There are still over a dozen great events on June architectural calendar, including a lunchtime lecture this Wednesday at CAF by Gary Gand on the new book Julius Shulman: Chicago Mid-Century Modernism. Check them all out here. 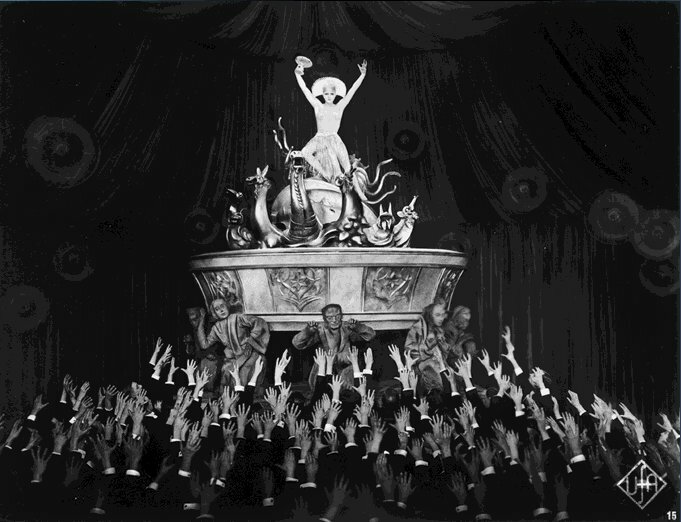 That impersonal crowd, always moving, dares you to create a life for yourself in its indifferent surge. The people swept up in it, like you, are each obsessed with their own concerns. Falter seriously out of step, and you can get flushed downstream without a second thought. 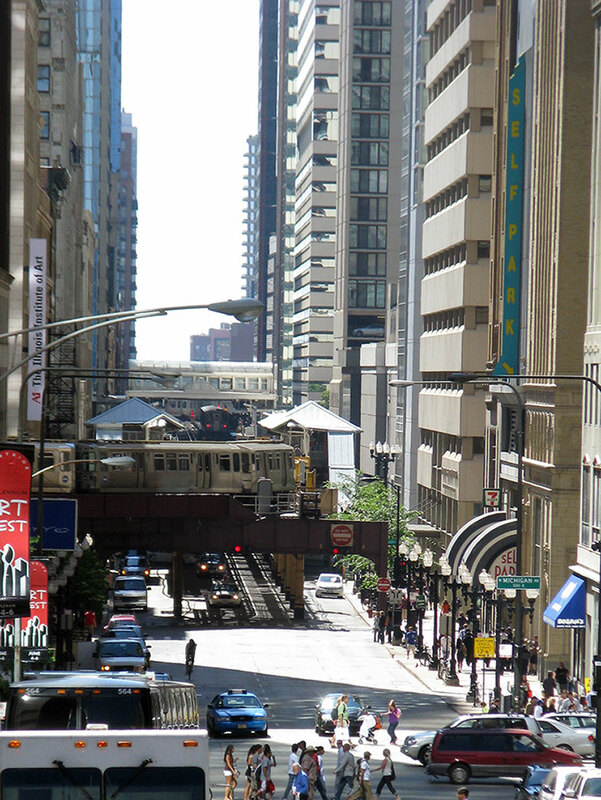 When a city works, though, the stream becomes a weave, and we find ourselves connected to others in ways we might never expect, and encounter experiences we never could have imagined. That was what is was like, that first time, walking down Michigan Avenue on a cold winter day, invisible to the rest of the passersby making up the stream of the moment, and hearing, in the distance, the sound of the opening notes of Meistersinger, being played on a tuba, breaking through the dull nothingness of the commonplace. 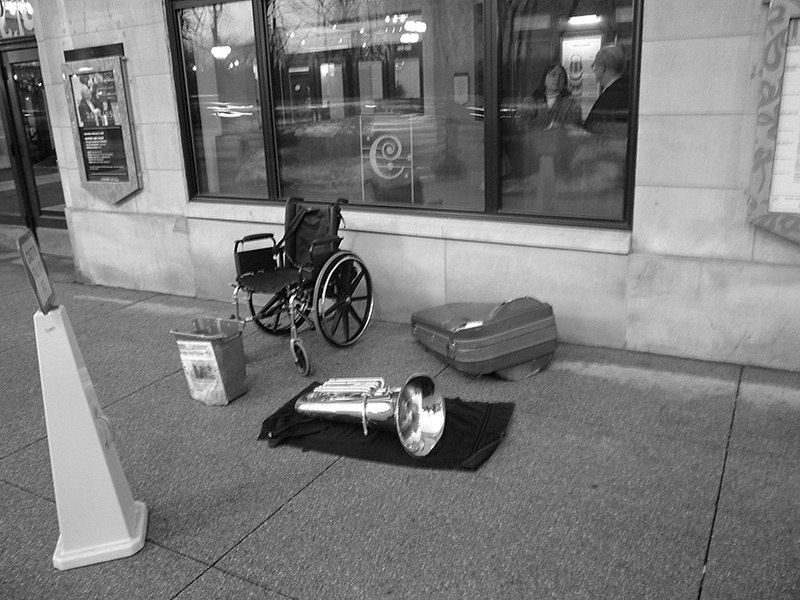 That was Aaron Dodd, playing his tuba on a street corner, with a tip jar consisting of a plastic bucket. He died last Thursday at St. Francis Hospital in Evanston. He was only 62. It's probable that Aaron's largest audience was all those people who passed him as he was playing. 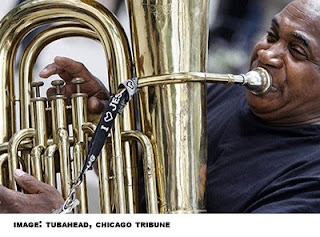 Some thought of him - or wrote about him - derisively, just another freak on the street, who just happened to be playing a tuba, but as William Lee's obituary in the Tribune indicated, Aaron was a lot more than that. 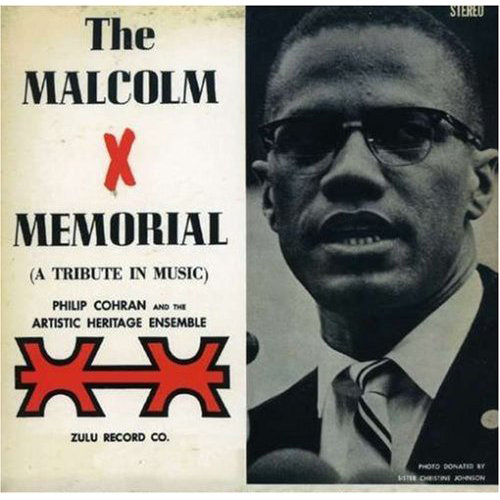 He was accomplished jazz musician, a founding member of the group 8 Bold Souls, which released four highly regarded albums from 1987 to 2000. You can check out and buy three of their albums on iTunes. Before that, as a very young man, Aaron was part of the session group for Chess Records. In 1967, he joined the Artistic Heritage Ensemble, led by cornet player Phillip Cohran, and can be heard on albums such as 1968's Armageddon, and, from the same year, The Malcolm X Memorial (A Tribute in Music). He later recorded with the soul/jazz/funk group The Pharaohs, with drummer Maurice White. (Check out Aaron's solo at about 5:53). Aaron, like a lot of us, went through some tough times, but his tuba was his lifeline. I remember him lugging his 35-pound horn onto the bus on the way to the day's gig. I remember how he always had a smile and a warm greeting that brightened up the day. 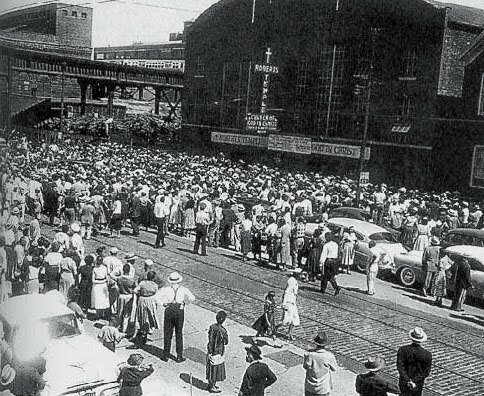 He told me of taking lessons with the CSO's great tuba player Arnold Jacobs, and he would have tears in his eyes telling me how Jacobs looked past the color of Aaron's skin at a time when race-based barriers were still very real, barriers without which Aaron's career might have taken a very different turn. I remember how proud he was showing me his new tuba, purchased for him by the brass players of the Chicago Symphony, among the best in the world. 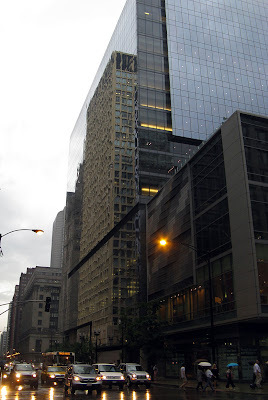 Once, in the First National/Lake Shore Bank on Michigan Avenue, he introduced me to his mom, and I remember how broken up he was a couple years later telling me of her passing. Aaron started using a wheelchair. He told me it was for transporting his tuba, but it was clear he was depending on it, too. According to Lee's Tribune piece, Aaron, who had obstructive pulmonary disease, was finally told by his doctor that "his lungs were too diseased for him to play." The end came not long after. Aaron wasn't a marquee name, like a Daley, or an Oprah. To most people, he was a nameless oddity; to some, a nuisance. But he had depths not immediately apparent. The uniqueness of his presence subverted the generic anonymity of the impersonal stream. 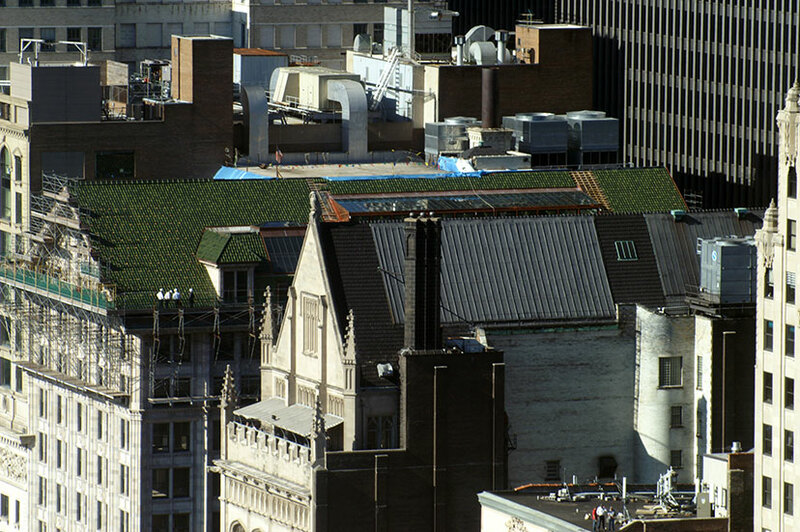 In the music of our city, some key notes have just gone missing. 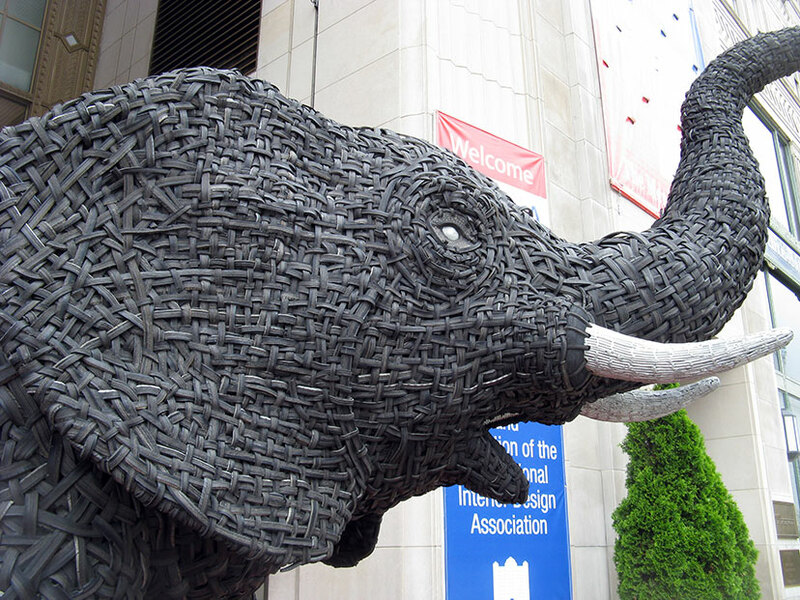 The sculpture is named Nomkhubulwane, it's made of galvanized steel and recycled truck tires, and it was created for the Human Elephant Foundation "to catalyze conversation about how to creatively address issues caused by the expanding human ecological footprint." Nomkhubulwane has been on a world tour. Last weekend, Nomkhubulwane was at Crown Hall at IIT. 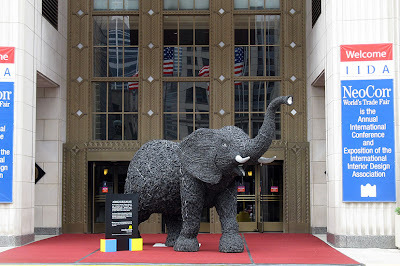 It will be a the Mart through the 16th, afterwhich it will move to northeast Terrace of the Field Museum through July 30th. 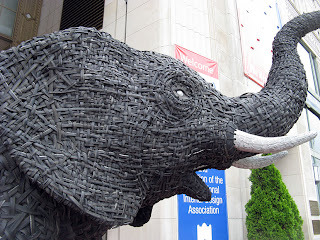 South Africa sculptor Andries Botha will also be in Chicago this week. Today, June 15, 7 to 8:30 p.m., he will join Theaster Gates of the to U of C to discuss Public Intellectuals Shaping Public Space at the Franke Conference room, JRL S-102, 1100 East 57th. 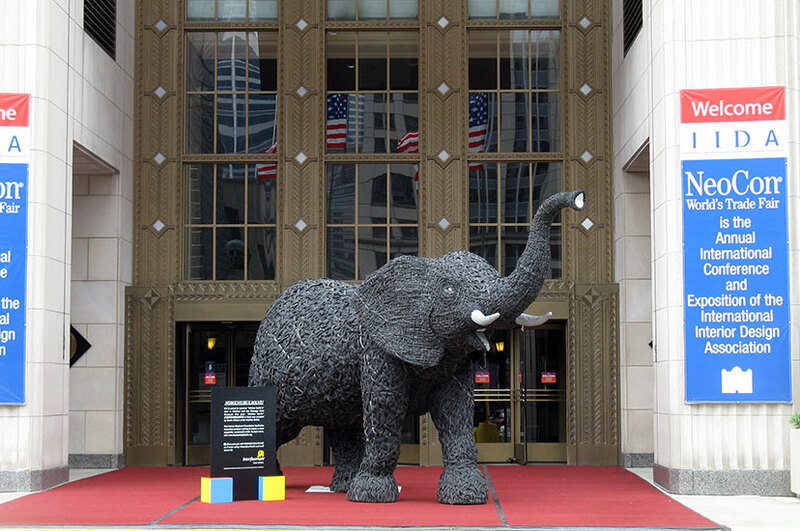 On Friday the 18th from 11:30 a.m. to 1:00 p.m., Botha will be at the Field Museum to lecture on Can We Live Without the Elephant? Register via email by the end of today. 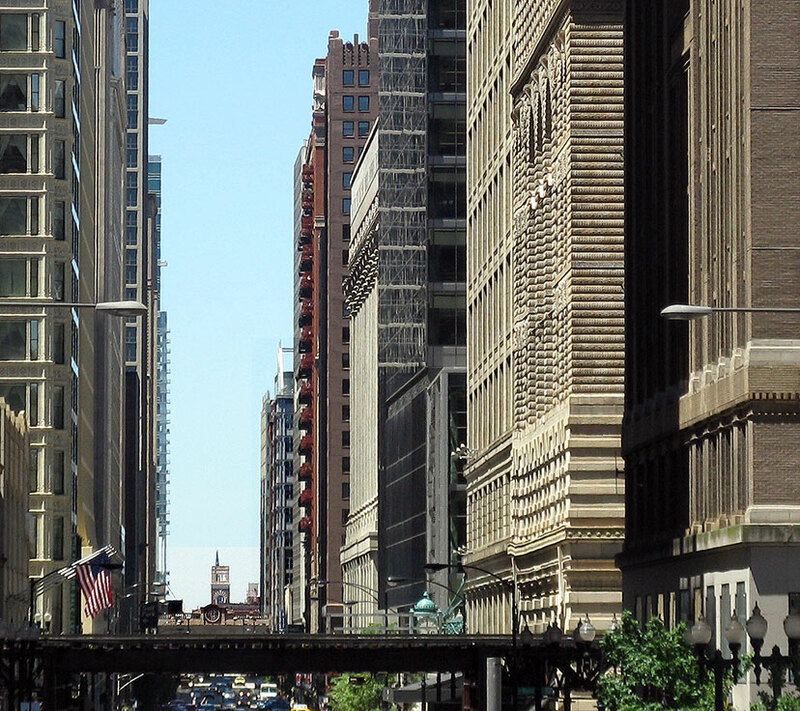 Also at NEOCON today, June 15th, from 2:00 to 4:00 p.m., architect Kerl LaJeune of Atelier Azara, Vocalo architecture critic Lee Bey, Renee Kemp-Rotan, urban designer and co-founder, Black Design News Network; Atim Annette Oton, architectural designer and co-founder, Black Design News Network; and Bryan Hudson, Architect, principal at SOMA Design Consultants Inc. will appear at Disaster SOS: Haiti, a forum on Haiti where "experts from the fields of design, planning, international development and cultural anthropology. The forum will involve critical thinking about shelter and disaster with a focus on planning, cause and effect, and risk management after a disaster. . . . This session will be followed by an interactive discussion and networking hour for potential collaborations and partnerships from 4:00 to 5:00 p.m."
The event is sponsored by IIDA, FocusOnDesign, Designers for the 21st Century (D421), Project Osmosis, and The Black Design News Network. It's at the IIDA Learning Center at the Mart, $15.00 at the door, CEU: 0.2, registration via email or at the door. 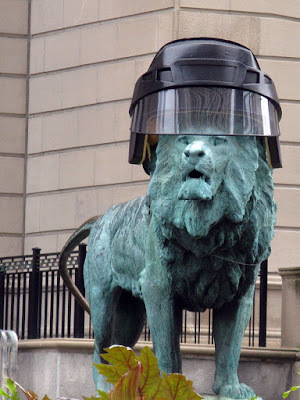 Is it just me, or do the helmeted Art Institute lions - if you don't see the team logo - look a bit like an homage to the 1968 Democratic convention? When you think of Bruce Graham, the master architect who died this past March at 84, Lucien Lagrange is probably not the architect whose name next comes to mind. Working with uber-engineer Fazlur Khan, Graham created some of Chicago's greatest architectural icons, including the Willis (aka Sears) Tower, the tallest building in the world at the time of its construction, and the John Hancock Center, the romantic, tapering tower that sets Gershwin playing in my head every time I catch a glimpse of it out my window. 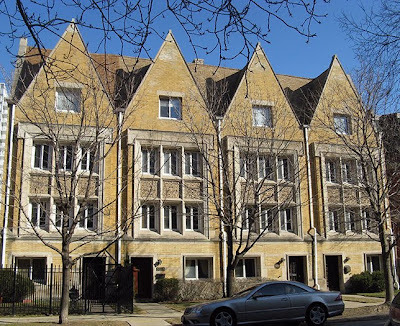 Lucien Lagrange, despite such accomplished forays into modernism as his spiky Erie on the Park, is best known for vaguely classicist designs that have endeared him to his clients, if not the critics, and placed him among the city's most successful architects. 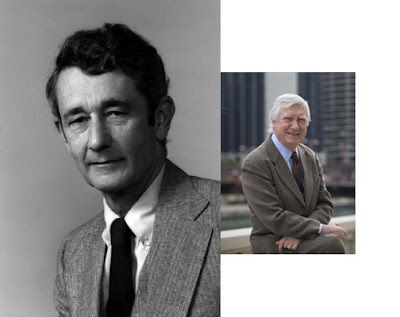 However, Graham and Lagrange shared a strong link, one that will explored at what promises to be an exceptional event at the Chicago Architecture Foundation next Wednesday, June 16th, Remembering Bruce Graham, where Graham's legacy will be discussed by a panel including Lagrange, author Franz Schulze, who refers to Graham as "the Burnham of his generation", and Richard F. Tomlinson of Skidmore, Owings & Merrill, the firm that was Graham's home base for nearly four decades, and where Graham quickly became Tomlinson's mentor when the younger architect joined the firm in 1972. While the Provence-born Lagrange was studying architecture at Montreal's McGill University, he came to Chicago in 1968 seeking a summer internship, and, after not getting a position with the firm of Mies van der Rohe, wound up at SOM. 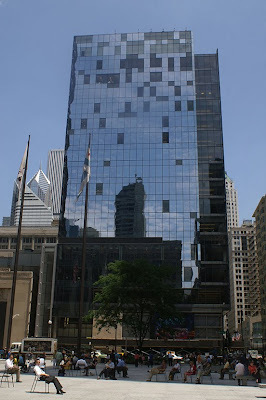 In his second week there, his drafting skills got him assigned to working as a designer for Bruce Graham and Fazlur Khan, just as the Hancock Center was moving towards completion. "I really started to understand steel through their teaching." Lagrange has written. "They were incredible people with visions of buildings and structure." Although known for structures with simple, strong and striking visual profiles, Graham was acutely aware of the kinetic aspect of architecture. "Architecture," he said, "is in the design of space, both interior and exterior. 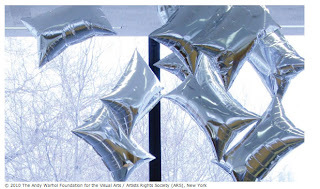 So it's much more closely related to dance than it is to painting or sculpture." Remembering Bruce Graham takes place from 6 to 7:15 p.m, Wednesday, June 16th, in the Lecture Hall Gallery at the Chicago Architecture Foundation, 224 S. Michigan. $5.00 for non-members, $10.00 non-members, and you can still register on-line here. 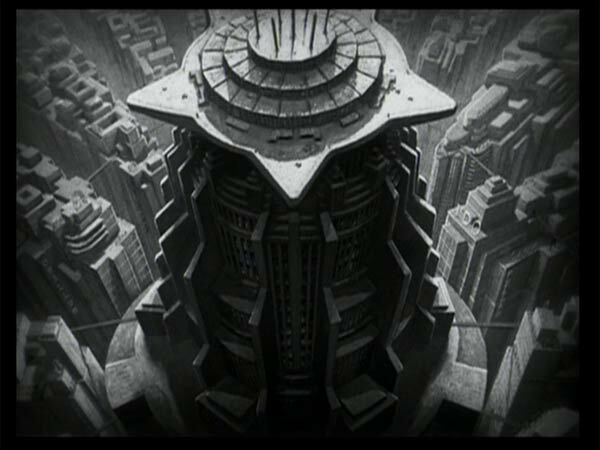 Metropolis is playing at the Music Box Theatre, 3733 N. Southport, through Thursday June 17th. It should not be missed. 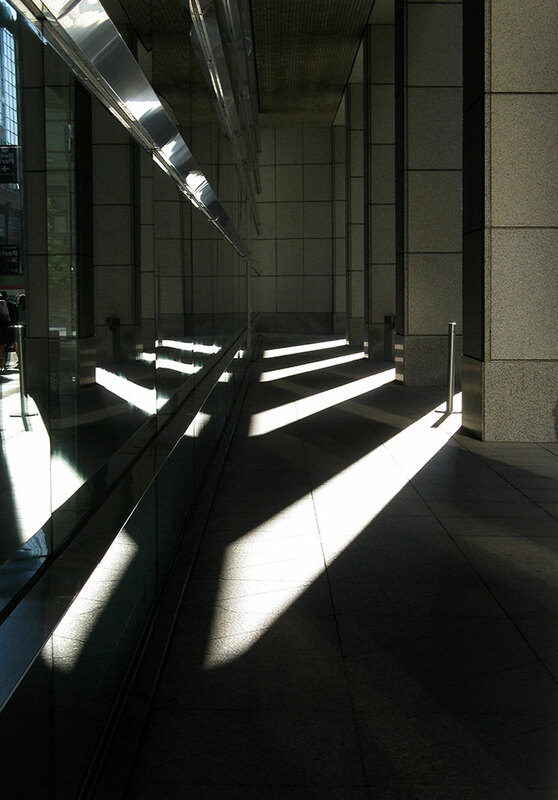 The shining temples we build for our cities, sacred or commercial, serve both as reflection of our hopes and cover for our darkest desires. 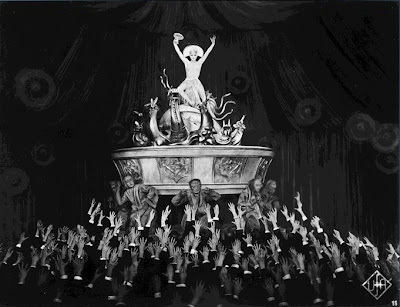 Nowhere has this been more forcefully - and entertainingly - expressed than in Fritz Lang's delirious 1927 film masterpiece, Metropolis. A consideration of the film's spectacular architecture - images, in abundance - here. *with acknowledgements to those who helped get you there. Continually pressed to find new ways to stretch revenue dollars in a troubled economy, Chicago Mayor Richard M. Daley has turned to an innovative team, made up of artist Tony Tasset, scientists at MIT'S Moureau Genetics Labs and legendary intelligence intercept expert Harry Caul. to create a cheaper, more economical alternative to the placement of thousands of cameras throughout the city to prevent and prosecute crime. 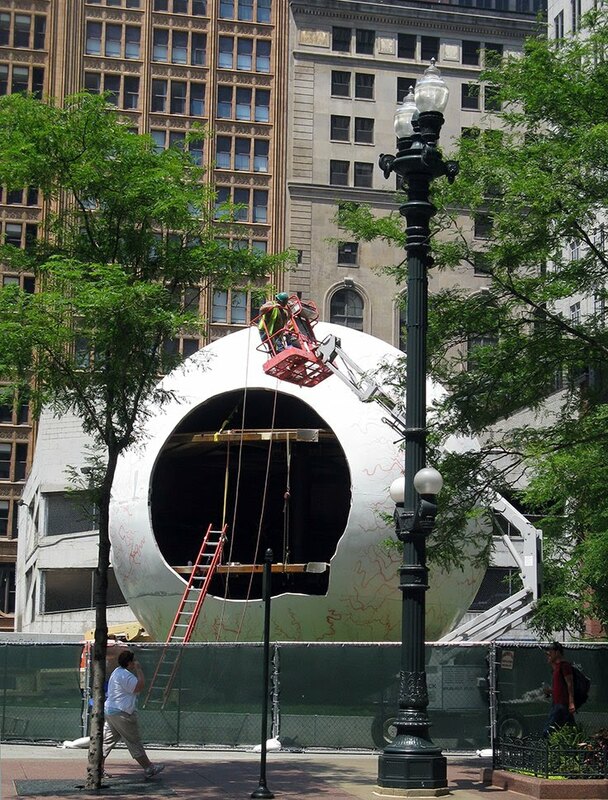 The first prototype of their creation, Eye, will be unveiled July 7th at Chicago's Pritzker Park. Thirty feet high, it will be able to see everything going on in a 20-block radius, both on the street and in building interiors, including washrooms if you forget to close the door. 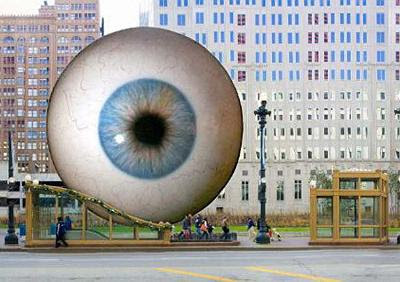 A fiberoptic central retinal artery connects to Chicago police headquarters, with a subsidiary thread instantly streaming especially embarrassing video captures directly to YouTube. "Obviously we expect deterrence to be as much a factor here as documenting crimes," said city spokesperson Angelica Lee. "We think potential perpetrators will think twice having this humongous orb looking over their shoulder, or maybe just be so creeped out all they'll want to do is lie down and try to make the nightmares stop." The cost of the project had been underwritten by Lancôme L'Extreme, which is also contributing the mascara for the Eye's lash. Murine will be donating the 27 gallons of drops required each day to avoid Eye irritation from State Street's exhaust and pollution. Should Eye actually water, however, or shed tears over the sadder aspects of the humanity passing by, all liquid will be collected and recycled to water heaven. A second battery of conventional cameras will be set up watching Eye 24 hours a day to make sure no one pokes it with a sharp stick. The project is already the object of strenuous protests from PETOBP (People for the Ethical Treatment of Out of Body Parts), who claim that keeping Eye open, all the time, forced to perpetually bear witness to the horror of mankind, is in fact a subset of the Ludovico technique, and therefore a form of torture. 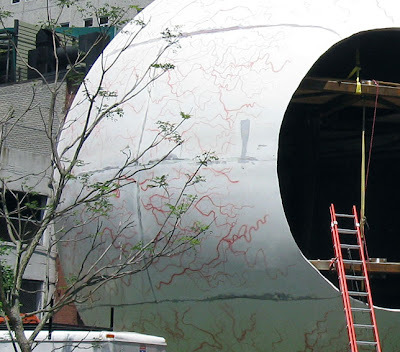 The project is not to be confused with I!, a different MIT Moureau Labs collaboration, this time with John Mayer, which resulted in the creation of a 30-foot-high throbbing shaft, mounted on a flatbed truck that can be rushed to quell riot scenes by sucking rioters' raging testosterone out through their pores, or, should that fail, just using the shaft to beat them senseless.